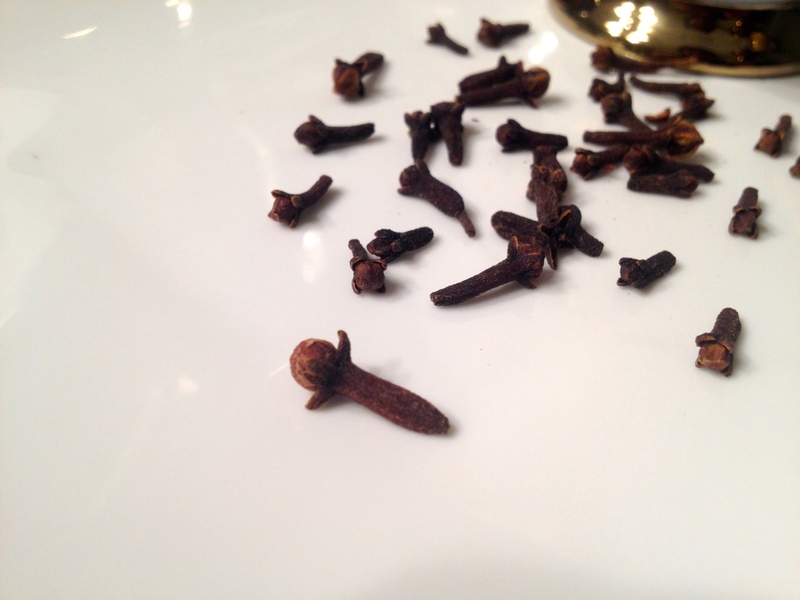 In Indian cooking, cloves are seldom used in desserts. They are generally reserved for savory foods. A single bud of clove will heavily perfume a pot of boiling rice. 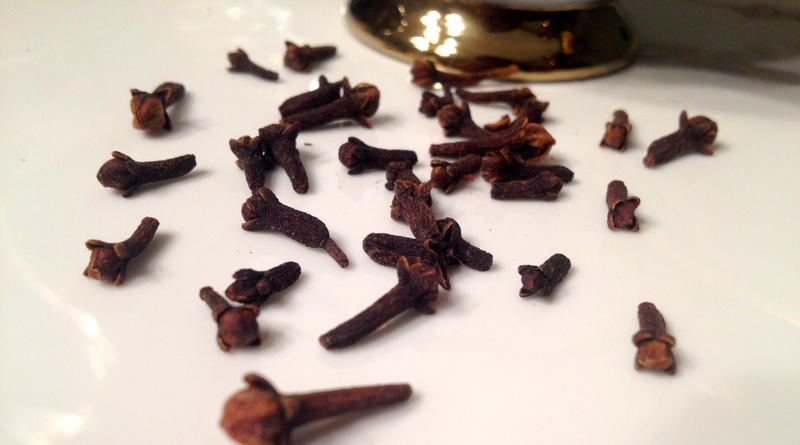 And I particularly think cloves pair really well with yogurt in marinades for dark meats, such as goat and lamb. This fragrant spice is ground to a powder and included in the preparation of a delicate Biryani. Biryani is a flavorful rice dish full of spices and tangy flavor and this exquisite dish is reserved for weddings, special occasions and religious or cultural holidays. Cloves are one of the key components in most gharam masalas. Gharam masala is an Indian spice blend that is unique to each family or culture, and may include peppercorns, cumin, coriander, cinnamon, as well as cloves, amongst other spices! Clove oil can be used as an anti-inflamatory, antibacterial or for its mild anaesthetic property too. A little clove oil rubbed into the gums temperarily relieves a toothache. Here’s a little take back in time of when I was a young budding cook. I was about twelve or so, and I decided to make soup for my grandma. I seriously feel the need to impress her. I spent what felt like hours cutting the vegetables perfectly and slicing the chicken into neat little cubes. But all hell broke loose when I threw in loads of whole spices, I went absolutely batty with the cloves and threw in between fifteen to twenty odd cloves! I was horrified when I tasted the soup after hours of simmering. It tastes like dish soap! I was so embarrassed and felt defeated in some way, who knows why? Although, I’m sure my grandma didn’t think any of it. As of that day, I’ve been using cloves with extreme caution. And I would caution you to do so as well! Heres the recipe to the soup I made, obviously minus the million buds of cloves. I really enjoy adding ground cloves to several cookie recipes, especially if they involve ginger as an ingredients. These two spices do well together. I have recently experimented with adding a teeny bit of clove powder to a white fish sautéing in a lemon ghee sauce, and the clove complimented the fish really well. So go ahead give cloves a try if you must! It will be fun! Just a few words .. use with caution! This entry was posted in Spices and tagged biryani, cloves, ghee, indian cooking, indian food, Indian Spices, spice, spice cupboard. Bookmark the permalink. Enjoying very much your spices posts! 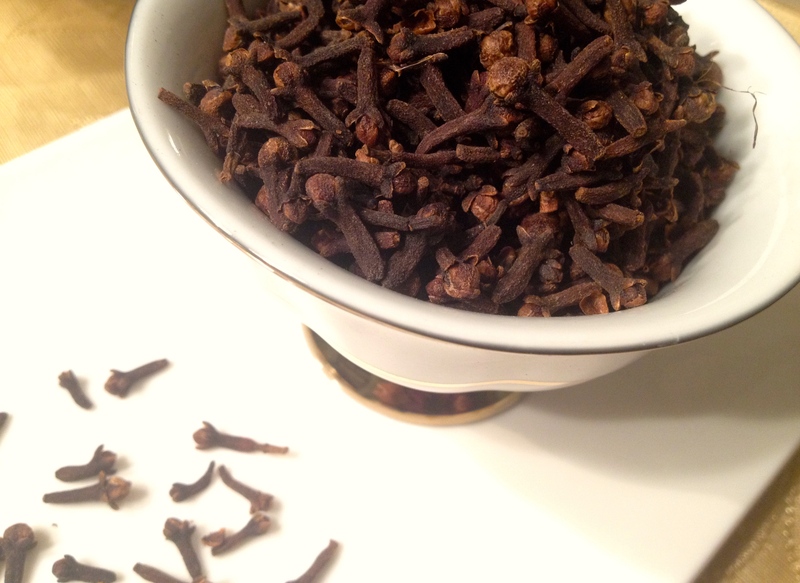 I ve recently started putting cloves when making white rice…it gives it a rich taste! That’s so cool Meriem! It does give rice such a unique flavor. Great post. I like clove but like you said, use it sparingly. Aren’t cloves just great! Thanks for stopping by Julie. I love the smell of cloves in the winter. Funny story..I like to simmer apple cider with cinnamon on the stove as a way to make the house smell nice in the fall and winter..the other day I threw in some cloves and later discovered the house smelled like biriyani! That’s too funny! So you understand my ‘use with caution’ sign when it comes to cloves. A little goes a long way! No spice mix would be complete without the addition of a few cloves. Yes, clove is a strong spice and as you mentioned, less is more. If chewed raw, it can go the the extend of numbing the mouth. I even use it as an insecticide to spray on indoor plants. I love the fact that you can use cloves as an insecticide. I had no idea – I’m definitely going to give it a shot. Do you use clove oil in some water? You know what Liz? I’ve always wanted to stud an orange with cloves. I guess now is the time with the holiday season in tow. I’d love to know what to do after the orange has been adorned with cloves? lol, Shamin, I have no idea. Maybe put it in a stockpot full of red wine and call it mulled wine? Or use as part of a fragrant centerpiece on a holiday table? Funny–never thought of what you’d actually do with it! Oh I so love putting cloves in rice – reminds me of Zimbabwean Indian weddings. Huge pots of rice being cooked over a natural outdoor fire. Remember? Yup cloves and rice! so good… dream… I miss those huge pots of rice boiling away on the open flame… more dreaming… 🙂 Cloves in apple cider does sound good.. slurp! I must be honest; not my favorite spice – it is very strong and I don’t like it when a whole pod ends up in a mouthful of food, but it is good when used subtly. So interesting to read about cloves. I love how they smell, but I never knew that they are just dried flower buds of an evergreen tree!